I woke up early Christmas Eve morning. The rest of the family slept as I unloaded the dishwasher, started a batch of cookie dough, and sipped my coffee in the quiet of the morning. I knew that it wouldn't be the day I had been dreaming of. I love traditions and was the kid who grew up trying to force them upon a family that didn't seem all that interested. In some ways, I still do. I wanted time. I wanted someone to be by my side in the kitchen all day, or at least in the other room laughing with the girls. And instead all I was going to get was dinner. My heart felt dejected, as if all of the years trying to make a family didn't matter. Attempting to force feed joy and togetherness to someone who didn't want it while all the while I battle exhaustion ....Let's face it, I haven't been the poster girl for joy in quite some time. I press play and listen to "Let it Be" until I believe it. And when the night is cloudy there is still a light that shines on me, shine until tomorrow, let it be. I wake up to the sound of music, Mother Mary, comes to me speaking words of wisdom, let it be. But my Sophie girls wasn't far behind me. She came into the room with that smile that lights me up from the inside. And the next song came on, a little something from REM, and I had no choice but to wrap her up in my arms and spin her around the room over and over as we danced and laughed, even while the rest of the family slept on. This morning is not how I imagined it, but there is peace in the smell of freshly brewed coffee, the sound of Sophie's laughter, and the warmth of my kitchen. We gather around the table, full of people I love. It's not the scene played during the opening credits of Parenthood that I imagine for my family someday. There are kids running around laughing and we don't even attempt to get them to sit down and eat. But it's good. And there is peace in knowing that our home is full of love and laughter. The kids open their gifts and are full of smiles and squeals and all that you want from preschoolers on a Christmas morning. There is music playing in the background, "Let it snow, let it snow, let it snow," as one of the girls happens to peek outside the window. And there is our little Christmas miracle. Snow is falling. Just enough to cover the dirt, cover the mess of the city. Cover the mess of my heart. We exchange our little gifts. I was given very strict parameters. I stayed close. He did not. Not one, not two, but three. I tell him that I am overwhelmed and that I don't deserve this. He says it's not undeserved, it's overdue. We spend the rest of the day holding hands. There is peace in the love of a family. In the love of a husband and wife. This isn't written by the glow of the Christmas tree while snow falls softly to the ground and my family sleeps soundly. Instead, there is the hum of the city coming back to life after a day off, cartoons, and three little girls playing. We have moon dough, a rice sensory bin, and glitter paint all being used at once. It's chaos here folks. It's not how I imagined it, but there is peace in knowing my babies are happy and playing and laughing. I work so hard to create this life that I want for me. That I want for my family. I fight for it. We fight for it. Everything is just so hard. And this season I think of another mother who undoubtedly had different hopes and dreams for how things would play out. But we all know that story, and I know that we don't see the end when we are still in the middle. 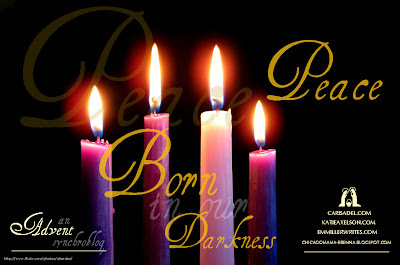 I'm so grateful for this Advent, this time of reflection. As I type out my last post of this series I think how Hope, Love, and Joy aren't complete unless there is peace. Unless there is the knowledge that God is in the middle of our mess, that He is guiding us with His strong hand. All this fighting. All this striving. It's just too much. Today I throw in the towel. I will stop trying so hard. I'm going to allow bits and pieces of peace to flow in me and my family. I'm a lot happier for it. Today I write about Joy. 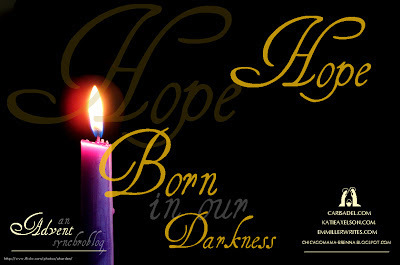 On the first week of advent, I wrote of Hope. And my words then, seem so much more fitting now. And all I can hope for, here in the darkness of unmet expectations and brokenness is, "But God....." And I dare not pray my prayers aloud, and I wait, I hope, for the dust to be born back to flesh. I don't know how to write about joy. I know joy is not the same as happiness. I have the choice to go on and live life as if Friday didn't happen. But it did. And it changed things. In a town, about 90 miles from where I lived for most of my adult life, there are families fighting for breath, drowning in tears. I can't write about joy. On Friday I registered my big girl for Kindergarten testing and the lottery system to get her into a school better than our neighborhood one. I sat at my keyboard, hands still trembling from the news, and picked schools in the City of Chicago that we want her to have a chance to attend. Chicago is only eleven murders shy of surpassing the number of US Troops killed in Afghanistan during its bloodiest year. And we have had over two times the number of people killed by gun fire since 2001 than have been killed in Afghanistan. The irony of all of this is not lost on me. I don't know how to write about joy. On Sunday, I walked up and down the hall of the Preschool wing checking on teachers and praying over the rooms. I felt like a sentry, guarding those children because suddenly the world was a little worse than it was last Sunday. I don't know how to write about joy. Not after Friday. Here, in the Now, I grasp at a joy that sustains during tragedies, violence, sickness, death, war, genocide. And I know that joy should be there always, dependent on our inward life and heart, not on our outward circumstances. But on days like this it seems so far off. And I look to the not yet, when His Kingdom will reign. When there will be peace. When I don't have to talk to my kids about what to do if someone comes into a school with a gun. Yesterday, I peeked in at children's church and hear them worship. And on those faces, I saw Joy. They were singing, some eyes closed, their little hands raised. They had smiles on their faces. I don't know how to write about Joy. Not right now. But their voices, lifted high, reminds me of the God who gives joy. The God who is with us in our suffering. Who is close to the brokenhearted. 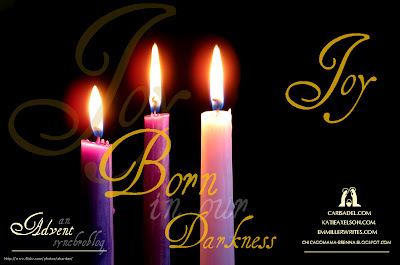 The God who was born in our darkness. The God who is bigger than all of this. The God who held each baby tight. The God who will set all things right. And that, gives me Joy. Would you like to join us? 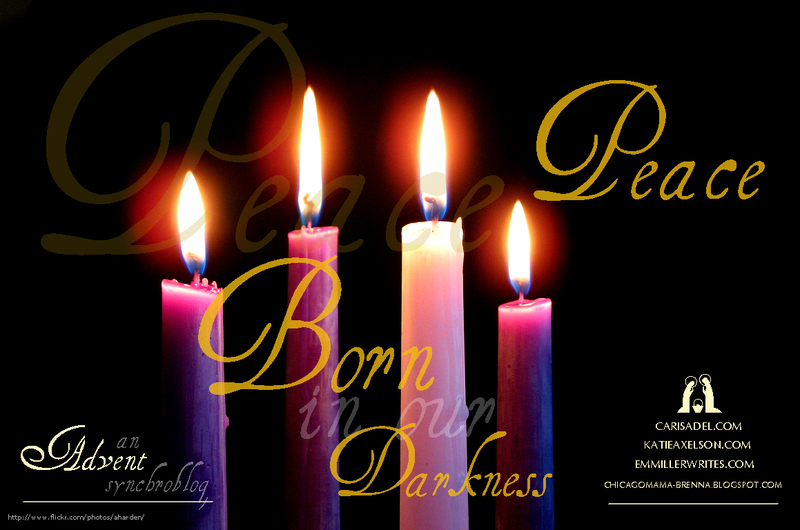 We would love for you to share your stories of Advent. Your stories of JOY reaching down and meeting you in the darkness. Even this darkness. This is a thank you note, of sorts. My week started like every other week, other than in the back of my mind, I had a glimmer of hope for something that seemed other worldly to me. After a month (or is it closer to a year) of challenges that have left me tired and discouraged on so many levels, this was going to be my redemption. Maybe you've done it too....you have this possibility and your mind starts churning thinking," Ah-hah! This must be what God had planned all along." You are a regular Sherlock Holmes, not only excited about what must be in the future, but now you are proud of your supernatural discernment. You, my dear, must be gifted in the prophetic. And so it builds. Until. That door is closed. And you realize how much you hate that tired cliche of God closing doors because He is going to open a window. And you go from disappointment, to sadness, to anger, to frustration, back to sadness. Soon you start thinking about how you didn't deserve it in the first place, and then the self-deprecating talk begins. On Tuesday evening I sat down to prepare my post for Wednesday. And all the hurt, and disappointment, and confusion started to come out. And sitting at this table, looking at my laptop, I decided that I just didn't want to feel that way anymore. So I wrote out the words that I would say if given the opportunity. It was a whisper. That was my Wednesday post. Through this week I have felt affirmed. I have stopped feeling so very alone. But more than that, I have felt loved. I have felt loved by all the comments, the tweets, the messages, the emails, from friends and strangers alike, saying they will travel this road with me. But even more than that (and believe me, that is so much), I have felt my Heavenly Father bend from the Heavens and wrap His arms around me. I've felt Him stroke my hair as I fall asleep and whisper His promises to me. I think I may have heard Him rejoice over me with singing. It's Advent, and I think about those who were waiting for their Messiah. I think about those still waiting. They hold on to Hope because that's all you can do when waiting. But in the waiting, it's sometimes hard to feel love. A baby? Not a king? This wasn't what it was supposed to look like. My life? This isn't what it was supposed to look like. But loved ripped through history. It came down to save a people. It saved me from myself. Love disturbs my expectations on a daily basis and challenges me to hope for something different than my own desires. Love dares me to see the world, see my world, through the eyes of the Creator. Love gives glimpses, but never the whole. And when I start to worry and wonder it whispers, "Trust." Love holds me in the moments the waiting feels forever. Love tells me that I'm not alone. Loves shakes me when my focus stays too long on me. And Love....Love is what opens my heart to His freedom. "A prison cell, in which one waits, hopes...and is completely dependent on the fact that the door of freedom has to be opened from the outside, is not a bad picture of Advent." Here, come have a seat on the sofa, there's plenty of room. The most we have fit on it so far is 13, but there is always room for one more. The Christmas tree lights will give this room a glow, along with the candle I always seem to have burning. I have coffee, tea, and even wine if you'd like, makes no difference to me. If you are hungry, my fridge is full of leftovers, but I can easily whip up some pasta and my meatballs and sauce for you. Did I tell you the bread is homemade? My table seems to always have someone sitting at it. Sometimes for eating, sometimes creating. My kids will be running around, showing you their dolls, their toys, their books, their pictures. I hope you don't mind. I have something to share with you, but you'll have to listen close to hear. I have only this home, this place. I have no platform. I have no tribe. Just a handful of people who love me, believe in me, and speak life to me. My words aren't shouted from the rooftops. And maybe they aren't meant to be. But I do have words to share. And sometimes they'll be quiet. Sometimes just a whisper. But I'm writing myself out of the darkness. I'm writing myself through the brokenness. I see hope. I see redemption. I see the light placed inside of me by my Creator. And I see the light inside of you. I see the things that He has put in you. You were born to serve the Lord. You have been knit together by the Creator of the Universe, and that creativity flows through your veins and I see it in you. I see the ways your eyes shine when you talk about that thing inside of you. I want to hear it all. I will listen to the ones we call voiceless. I will take the time to hear their story. And I'm going to love you with my Momma's heart, because that was what I was born to do. And I'm going to tell stories. I will tell stories of children shaking the Heavenlies. I will tell stories of the places we've traveled the people we've met, and the Kingdom breaking through. I will tell stories of this city full of both life and death. I will tell stories of healing - body, mind, and spirit. I'm going to keep talking, keep sharing the words birthed inside of me, even if it's just a whisper that no one seems to hear. I'm tired of letting myself feel less than. Tired of feeling not good enough. I'm not going to measure my worth by the number of followers, page views, or comments. I'm going to let hope shine through this brokenness. All glory, all honor, all praise to You. On Wednesdays, I link up at Emily Wierenga's place for Imperfect Prose, a celebration of redemption. Join us there? The sky has decidedly turned gray and rain drops fall slow, moved by the wind, splattering against my dining room windows. No snow to be seen, but there is something comforting about needing to wear warm coats and having your windshield wipers turned on while driving, and it makes my once Minnesotan heart happy. The living room lights are off; we are left with the glow from the Christmas tree, the decorations, and the TV that plays a Christmas movie for the girls to watch while Adam studies for finals and I try to get my writing in. I am meditating on love, for on this second week of Advent, we light the Bethlehem candle and focus on the great love that God had for us in sending His Son to earth. A love that ripped through history. That came down to save a people. To save us. To save me. This is the motivation for it all. And yet, I am blank. And I shouldn't be. I am a child of God. And I know, and I know, and I know. The words get stuck when I speak about Love. But when at two a.m. when I am trying to soothe my three year old back to sleep and I hear the downstairs neighbors laughing as they play their video games, the bass reverberating through the very bed that my baby tries to sleep in, I have no love. And I am awakened by my anger. I am supposed to be celebrating a love so powerful that our actions and motivations are forever altered. Instead, I am face to face with the worst of me, and even in the darkness of two a.m. I can clearly see what I am. Who am I to write about love? And how can I say I really care about war, or famine, or families torn apart, or genocide, when I can't even love my neighbor? Here in my darkness, even while I feel so unworthy, I know that I am loved. I sit here, still broken. Still feeling the Big Hurt more than I want to. 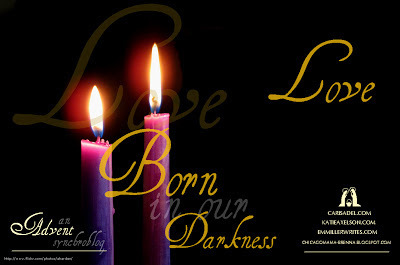 And I slowly become aware, that the Christ child was born in our darkness with a Love that can break through my hurt. Break through my pain. And it does not stop. He is relentless in this Love. Relentless in pursuing me. I fall on my face and cry out. So much of my life is made up of longing. Longing to be a better wife. Longing to be a better mother. A better writer. Better friend. Better teacher. Longing for more family time. More quiet time. More writing time. More quality time. Longing for a single family home. A backyard. A garage. A garden. Longing for so much. So much. As I long, I am so oblivious to the Love that surrounds me. That chases me. But it was longing that brought this Love to us in the first place. Not the human, sin-filled, me-driven longing that I know. A longing from the heart of a Father to save His children. To save my children. To save me. To save my downstairs neighbor. And in this place, my longings, my desires, my hurts are eclipsed by this great Love. A baby sent to be our King. To save us from ourselves. The Love that found me in my darkness. A Love that contains a power the earth had never felt. And it changed everything. It changes me. As I am broken, I allow bits of His glory to shine through me. And I am filled with His Love. Love big enough to save me from myself. And so tonight, I think of my broken longings, and a Love I simply cannot understand. Would you like to join us? We would love for you to share your stories of Advent. Your stories of Love reaching down and meeting you in the darkness. 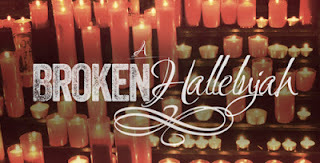 Today I am also linking up with another synchroblog, A Broken Hallelujah with Prodigal Magazine and SheLoves Magazine. Be sure to check them out as well for more stories of brokenness and redemption. 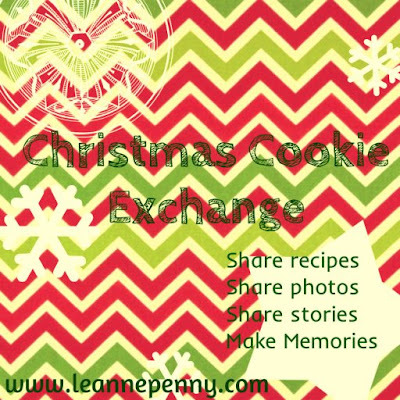 Today I am joining a dear friend, Leanne, in a virtual cookie exchange. And it's not about sharing recipes that will make us all a little more plump on January first, but about sharing the tradition behind it. And, can I tell you, here is where I get stuck. I don't know if it's universal, but I can say that I have always longed for traditions, that feeling of generations hemming me in. And although we had some, it never felt enough. I remember one childhood Thanksgiving I wanted it to be special. I used a sheet from the upstairs linen closet as a table cloth, set the table with the "good"dishes, and ran around like a manic ten year old begging everyone to dress in their Sunday best. I came to the table in some ridiculously out of fashion, second-hand, floor length, red and white gingham and lace number that was hiding in the back of the closet. Everyone was eating in the living room. Don't get me wrong, I have AMAZING memories of my childhood. But those things that I could count on, year after year? Those not as much. We try to build tradition into the very fabric of our lives with the girls. And even at five years old, I can see how my Kathryn craves it. Chocolate chip pancakes on home days. The golden ribbons on the Christmas tree. Hugs after each present opened. Baking bread on gray days. Lighting candles when we get home from school. All of my grandparents passed away long ago. Adam's mom passed away when we first started dating, so I don't feel like I have access to grand traditions of the past that I can pass onto my girls. But despite all that, there are a few things that give me that feeling of connection to generations past that I need. And one of those is my Grandma Betty's cookies. I don't know if this is the exact recipe. Move upon move has lost the original, but it is the closest my mom has been able to piece together, and for that I am so grateful. Grandma's and Mom's were shaped into crescent shapes, mine have become balls (it's just easier with the girls), but each time I make them I think of her,of them, and imagine holidays with extended families round a table, laughing, sharing, making memories. This afternoon, as I baked a batch, I thought of myself, 25 years ago, baking these with my mom on a snowy day in our house in Minnesota. And then I thought about 25 years before that, how my mom undoubtedly made them with her mother, most likely on a snowy day, just miles from where I now live. And as I rolled the sweet dough between my hands, I looked at my girls, and all felt right in the world. So put on some Christmas music (O Holy Night is required, in case there was any question) and brew a fresh pot of coffee (or a pot of tea) because these cookies should be eaten slowly with a warm beverage of choice.And remember, there is no egg in the recipe, so raw cookie dough is recommended. If you can be somewhat reserved by keeping them equal size and not eating the dough, you will be able to make 3 dozen. That did not happen here, and I have no problems with that at all. I poured over the story. I listened to each sermon intently, hoping to get that piece of informative insight that would placate my uneasy heart. But it never came. No one spoke of that brother with understanding. The best was pity, and that was sparse And with each sermon that passed, I grew just a scant more bitter because I never left. I was faithful. I've lived my life in the Church, and even within the confines of what should be a safe place designed to help people grow in who they are in Christ, I found myself constantly feeling less than. I had no grand story of overcoming "insert addiction or sin here" so my testimony wasn't encouraged. I was the kid who got saved as a preschooler. So only within the area of recruiting people to the work of children's ministries was my story given value. In these days of toil and fatigue as I battle a weary spirit, I've been thinking about that little story in Luke 15. When we speak of the "other brother" in the story of the Prodigal, "legalistic," "selfish," "angry," and "unloving," are all used to describe him. But I have a theory. I don't think that the brother was bad. I don't think he was selfish. I think his heart was slowly hardened over time, and when he witnessed the audacious and overflowing love between his father and brother, his heart simply broke. There is nothing in the passage to indicate that he didn't love his father. I think he loved his father so much that he threw himself into working for him. And I think it probably intensified after his brother left. He probably ended up so busy doing things for his father that he never spent time with him. In that moment, of seeing his father run and witnessing the embrace, I suspect that his entire life felt pointless, and while his brother was feeling love, he was feeling loneliness. Can I tell you how much I get that? I do. I'm the one who never "strayed." I stayed behind and tried so hard to do what's right. And I let myself lose the connection and relationship. I'm not the Prodigal who left and came back home. I'm the Prodigal who stayed and discovered that my heart had left. And this story? This isn't glamorous. But whether you find yourself shattered because you are left to try to pick up the pieces of a life you destroyed, or you are picking up the pieces of a shattered heart, we are all in desperate need of a grace to wash over us. We all have a story to tell. I am shuffling through this Advent season, hidden in the darkness of unmet expectations and brokenness, and I am holding on, waiting not so much for the answer, as for the hope that waits for the answer. And I am tired of being the other one, the one with the broken heart, tired, weary, and drained. The one who tried to do big things for God and has come to realize I am only left with longing. The older brother, that other one, could have left the field any time he wanted to and found his father, and his father would have given him the same embrace. I imagine that he would have been so pleased to see him leaving the work behind to spend time with him, that his father would have made a meal for him too, just so they could sit together, feast together, and just be. And I don't know what that looks like for me. I've grown to love this field I've been tending. It's hard work and I struggle with it, but it's all I know. I'm scared to leave and have that meal with the Father....I wonder what we'd talk about after I finished an ugly cry where I just let it all out. I've seen the others come home, embraced by the Father. And I sit, heels planted in this field, too busy to leave. But He calls me home, just like He does to all of His prodigals. For this child of mine was dead and has come to life again; she was lost and has been found. Today I am linking up at Emily Wierenga's place for Imperfect Prose - a community of people sharing their stories of redemption, where everyone's story has value. Sunday, December 17, 2006. Not another sermon about Mary. Each year there was a the sermon that talked about how young Mary was comparing her to "insert current pop princess here." My heart broke a bit each time. It started breaking in the years before I met Adam and the idea of holding a baby of my own was just a dream. It broke through the many years of dating, not knowing if I would marry Adam and start a family with him. And after we were married, there was a couple years of peace, but soon the longing started. And here we were, Sunday, December 17, 2006. A year of trying to have a baby. The doctor told me, "Sure you could get pregnant.....and I could become the Pope....but I'm not Catholic...." I left the sermon that day hot tears brimming over. The ache was too much. A winter evening with the youth group at a ski cabin hours away. He started praying over the teens in the way that young Pentecostal youth ministers do. I stand with them, praying that they will be open to receive this weekend when he starts speaking to me. And he starts quoting 2 Timothy and talking about the child that I will give birth to. I'm holding back sobs and I can feel that baby in my arms. And there will be a spiritual legacy and I'm not to let someone just say that there will be spiritual children. There will be many and they will be mine. And this is the hope that I hold on so tightly to when we choose not to take medication when the doctor says we can't have a baby. Sunday, December 24, 2006. Leaving the Christmas Eve evening service. I remember how the Christmas tree in the entrance glowed with such a soft and warm light. I can see the families snapping pictures in front of it. Tonight I am at peace, but just want to go home. It's the end of January. A Tuesday night, the 28th, 2007, and I remember how cold it was in that room. I'm at church helping Adam with the class he is running. And there is this moment. This moment of knowing. Marissa runs to Walmart for me and brings me the bag. The next morning, in the safety of my home,I go into the bathroom. Minutes later I come out and all I can say is "Holy crap," while crying happy tears. It's been said that two of the most important and pivotal words in the Bible are "But God." I don't know if I am ready to make that theological leap, but I do know the feeling of hope that comes when God reaches down, touches earth, and the problems and impossibilities of our world dissipate under the power of His touch. I have seen Him breathe life into dust. I am having my hair done and my hairdresser asks me to tell her again the story of how we became pregnant the first time. She tells me the IVF didn't take and she is running out of options. And I tread so lightly because I see her hurt and disappointment. And I speak of hope. And the words come out of her mouth, "But God." It is a December evening, six years later, and we are sitting in our living room with our three beautiful girls. And we speak of what might be and start to dream of the opportunities presented to us. But in just a few minutes time we are hit with news that is ripping our plans from us and leaving us feeling devastated. There doesn't seem to be a way around it and it doesn't make sense. These circumstances laid before us, the price of doing the right thing, being responsible, and hoping to make a difference. It all seems so bleak. If it weren't for the three girls, sleeping in their rooms, I might just give up. But God gave me what He promised. Would you like to join us? 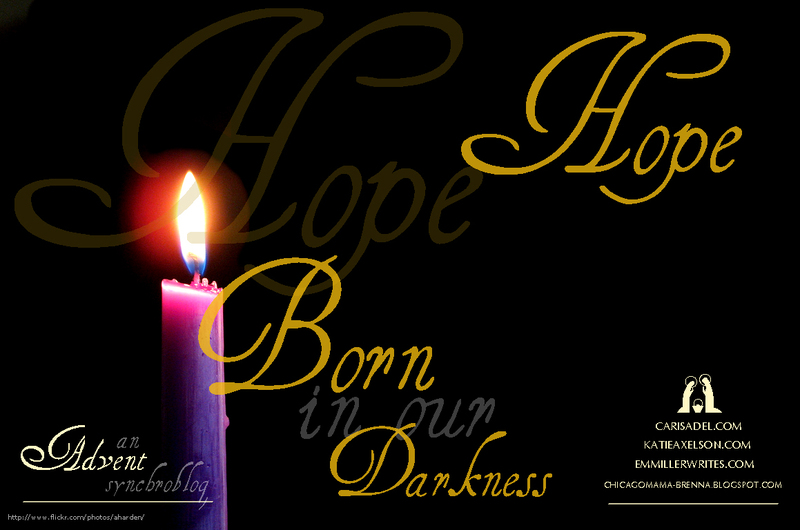 We would love for you to share your stories of Advent, your stories of Hope, your stories of God meeting you in the darkness.